The “Scaife Synoptical Method,” advertised at the top of the timeline, aimed to fit as much information as possible into a single chart. Information on Arthur Hodgkin Scaife is scant, but the Comparative Synoptical Chart Company, apparently based in Toronto, also published his “Synoptical Charts” of the “Cuban Question,” English history, and the life of William Gladstone. Figuring out how to view these charts properly would not be easy even for a person looking at the original. Get close enough to note the details and you lose sight of the overall pattern; stand far enough back to discern that pattern and you lose the details. Jacobs’ criticism certainly applies here. A war is a complicated thing, and the chart has tried to track so many factors—geographical, political, and financial—that it’s easiest to concentrate on one or two of these at a time. I noticed, for example, that the far left-hand column charts the decline in value of Confederate dollars, from one U.S. dollar in May 1861 to “nil” in April 1865, while the far right-hand column shows the decline in value of Union currency in relationship to gold, from $1 in February 1862 to $0.75 in April 1865. Perhaps the best way to approach such a chart is to give up on complete “synoptical” understanding, and delight in those details. I originally heard about this timeline from historian Peter A. Shulman on Twitter. It also appeared on the Explore Tumblr earlier this year. Previously on the Vault, another chart with ambitious goals: John B. Sparks’ gorgeous Histomap. 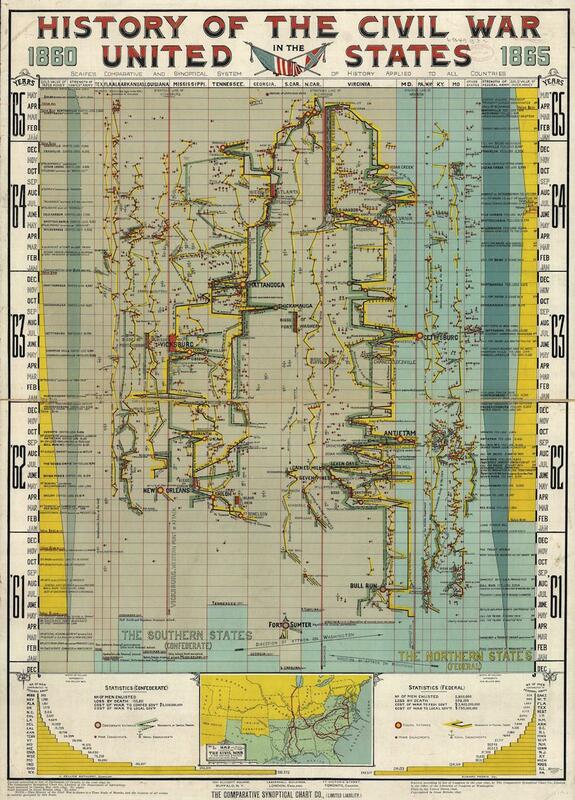 “History of the Civil War in the United States, 1860-1865.” Comparative Synoptical Chart Co., Limited. Library of Congress.